The human body is incomplete without the soul and mind. On a philosophical level, our body consists of energy channels, which if disturbed, can lead to various ailments, diseases and sickness. 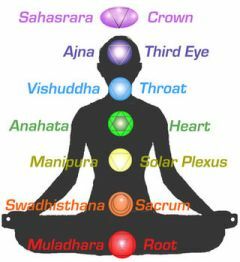 Our body consists of 7 energy channels or chakra which regulate the flow of energy in the body. Any disturbance in these channels will eventually affect the flow of energy in the other channels, giving rise to acute and chronic or long lasting health problems. Hence, it should be of utmost importance to maintain or try to maintain the energy balance in the body for the overall well being of mind and body. The chakra in the body are seven in number, representing different energy paths through which the flow is regulated. Different essential oils have been known to be beneficial in order to regulate blocked energy flow in the body or to enhance energy flow in a normal body. Since each chakra has a different path that it follows and different energy level and different effects on the body, the essential oil for each chakra is different. The essential oil that is used for rejuvenating first chakra is thyme and it is used to reduce stress. The second chakra can be activated by the use of lavender oil to reduce irritability. Rose oil for fourth chakra and for comfort in times of sorrow, hurt and sadness. The oil that helps fifth chakra is geranium and also acts as a mood lifter. Basil oil is supposed to help calm the mind by activating the sixth chakra. The last but not the least chakra, the seventh chakra, can be uplifted by the essential oil of rosemary. This helps increase nerve control. Of all the chakras, the fourth chakra is called the heart chakra. It is supposed to bring harmony in thoughts and action. This is one of the chakra that tends to go imbalanced due to everyday stress and the hectic job schedules. Heart Chakra is very important, because it is linking to the three upper chakras and three lower chakras. To open a heart chakra, usually we use Bergamot essential oils. It is allow love to radiate, promotes moral courage and helps people acknowledge their own highest gifts and appreciate them. In short, it is one of the sensitive channels in the body and need special attention before it could produce severe body problems. What is also of importance is the point of application of the essential oil. Different points on the body are supposed to be the places where these chakras get activated and using the correct oil at the correct spot on the body is the right combination to effectively balance energy flow in the body. Each session for the rejuvenation of chakras begins with sniffing the different essential as per the energy balance of the person. Single oil or A blend of chakra essential oils could also be used depending on what suits the person. All oils cannot be tried during the first session itself, hence in subsequent sessions, it is easier to pin point on which essential oils are having a positive effect on the health and thus can be used in further sessions. A variety of essential oils can be used to balance the energy flow in the chakras and this method has been found to be rejuvenating and having long lasting effects for longer healthy life. For a starter, you can use this aromatherapy meditation blends to help you more focus. How to use essential oils for your yoga practice? I have listed all the necessary one and use it for singly not blends.